Guest Column: Where Did IS Come From? The simple answer – and the one you'll hear most often – is that IS, or Islamic State (formerly ISIS) emerged out of al-Qaida, gathering strength through the ongoing civil war in Syria and unrest in Iraq. But that's only part of the story: the rest is based in Europe (and even in America), where governments have continually – if unwittingly – financed programs that breed radicalization in Muslim communities there. Now, more and more of those radical Muslims, most born and bred in the West, are joining IS and its jihad; and in their efforts to prevent it, Europe's leaders in particular may in fact be strengthening the threat. In fact, as IS strengthens its grip in Iraq, European Muslim youth are increasingly drawn to join. 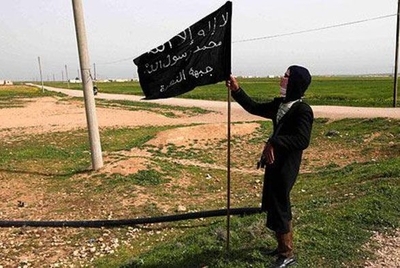 Following the gruesome horror of IS's beheadings and executions these past few weeks, the number of Belgian youth heading off to join the terrorist group in Syria increased significantly, according to Belgian security agency OCAP. Noted Belgium's Nieuwsblad: "The recent increase is striking, and is according to our information partly explainable by the enormous amount of propaganda that ISIS produces on social media. The spread of shocking images, such as the mass execution of 250 Syrian soldiers, and the execution of American journalist James Foley, seem only to send Muslim youth towards radicalization." It's not just in Belgium. Last week, Dutch officials arrested two families from the town of Huizen as they prepared to join the jihad in Syria, confiscating the passports of all parents and their six children, aged eight months to nine years old. Around the same time, the Dutch-American radical known as Jermaine W successfully departed for Syria with his wife and children. Jermaine, whose father was American, is well known in the Netherlands as a member of Holland's extremist Hofstadgroep, and as a friend of Hofstadgroep leader Mohammed Bouyeri, the terrorist killer of filmmaker Theo van Gogh. Jermaine was arrested in 2004 for a letter in which he outlined plans to murder activist and then-Parliamentarian Ayaan Hirsi Ali, but was released in 2006 on the basis of "insufficient evidence." Many of these European jihadists, like Jermaine, travel with their children, whom they then place in jihadist training camps in the hopes of producing a new, stronger generation of Islamic warriors for the Islamic State. Recent reporting from VICE shows a Belgian father coaching his very young son to kill "unbelievers," while other children play and train with rifles. But the problem did not begin with emigration to Syria. It began with the radicalization of these Muslims while they lived on European soil, attended European mosques and joined European programs for Muslim youth – programs frequently created in an effort to prevent such radicalization. But according to a report in Dutch newsweekly Elsevier, many presumably moderate mosques have used government funds to subsidize visits from extremist imams such as Usman Ali, who has given speeches at the Greenwich Islamic Center. Ali's fee, according to Elsevier, was paid through a €75,000 government subsidy ostensibly aimed at "preventing radicalization." By 2010, when government subsidies to the center had expanded to €168,000, Ali was serving on its board. Just who is Usman Ali? Among other things, he is known for showing videos of the 9/11 attacks to children, while preaching "Allah is the Almighty," ("allahu akbaar") reports Elsevier. The leader of what has been called a "powerful web of Islamic radicals and terror convicts," he has also been accused of inspiring Michael Adebolajo and Michael Adebowale, in the horrific almost-beheading of British soldier Lee Rigby outside the military barracks in Woolwich, South East London. In an interview with Al Jazeera, Ali denied the allegations. Similar situations abound in the Netherlands, most notably at Amsterdam's Blue Mosque, which is governed via an intricate web of organizations and finances by the Muslim Brotherhood, owned by the government of Kuwait, and led by Kuwait's Minister of Religious Affairs. Among the speakers invited there: Khalid Yasin, known largely for being the inspiration for "underwear bomber" Umar Farouk Abdulmutallab. Closer to home, the Muslim Association of Canada, which has received funding from the government of Alberta, has in turn financed Hamas and the Islamic Relief and Human Concern International (IRHCI). According to documents uploaded to Point de Bascule, a conservative web site based in Canada, "On its website, Islamic Relief Canada lists eight categories of zakat beneficiaries. These eight categories match exactly the categories listed in the Muslim Brotherhood-endorsed manual of sharia Umdat al-Salik." The organization also specifically encourages charity for "Muslims waging jihad: those struggling in the path of Allah." Western governments likely are not knowingly funding such projects: but as Elsevier points out, "German security agencies have warned for years – such as in their annual report for 2007 – that moderate Islamic organizations can breed radical groups. While they do not recruit youths for the jihad, by encouraging a strong 'Islamic identity,' they make the risk of radicalization that much greater." Now Europe is proposing new solutions to tidy up this mess. Top among them: revoking the passports of those who go to Syria, or who are stopped at the border or en route, as in the case of the two families from Huizen. But is this really the best answer? The Muslims who make the journey for jihad are already radicalized. They have already turned against the West, and committed themselves to battling against it – violently, and without mercy. Their minds and hearts are with the Islamic State, even as they live in Paris or New York, in Amsterdam or Detroit. Withholding their passports only keeps them where they are – among us, their enemies, the ones they plan to destroy. The uncomfortable, tragic truth is we helped create their murderous mindsets, their hatred of the West. That was our mistake. We should not make another by keeping them here, inside our own homes. Let them go. And lock the doors behind them. It is true that the Muslim fanatics that are rushing to ISIS have already been radicalized in the West, it is equally true that the blind adherence to multiculturlsm has facilitated and financed this howling mob but that in no way can explain the rise of ISIS . All the fanatics and all the money in the world cannot suddenly create an organization like ISIS. Whilst the howling mob of fanatics way well be at the front, behind them is an efficient organization that has not only mastered tactics and strategy but also propaganda, logistics and fiance. I think we are looking at an iceberg and seeing only the little bit at the top of the water. The eight recipients of zakat were not dreamed up by the Muslim Brotherhood. They come straight from the Qur'an, 9:60. We need her perspective if things are going to change. West has been actively support these radicals for decades. Not going too far into history, a few days ago, UK parliament has the audacity to debate on human rights in Kashmir, the region that is legally a part of India. How about a debate on Pakistan occupied Kashmir? 2 American citizens has been found to have actively helped Pakistan in the Cross border terrorism attack on Bombay (26/11). Has America handed over these terrorists to India to face trial? Supply of weapons to the failed state of Pakistan has not stopped. Remember the drawings in your high school history books of the British Red Coat Army during the American Revolutionary War standing shoulder to shoulder in a straight line formation waiting to catch some bullets fired at them from the camouflaged Colonialists? Today, the western civilized world has traded in their red coats for an invisible bulls eye painted on our chest. Heaven forbid we offend our Muslim friends, that would not be politically correct.. It is against our Christian values. After all, we are a civilized people and want to give others the benefit of the doubt. As our righteous President Obama is keen on reminding us, we should not judge the many for the actions of a few radicalized terrorists. Hmmm. I believe the world wide population of Muslims today is 1.2 billion. It has also been determined that somewhere between 15 to 20% have been radicalized or are strict adherents of Sharia law. That would translate into well over 150 million Muslims at the lower range that would prefer to see our heads on the end of a stick than on our necks. That sounds like more than "a few" to me. Time to separate the wheat from the chaff. Radical Islam is not diminishing....it is growing by the day.. It is Western civilization that is shrinking. Tough decisions lay ahead but need to be made before they can't. Passing the buck only puts off the inevitable but no politician wants to take responsibility for being the one to pull the trigger.